The AAP public service announcement (PSA) on medication safety is available. Find all PSAs here. Without a single word being spoken, this says it all…. This is the new Wear your Seatbelt ad the United Kingdom is doing. It was started by someone not hired to do it, but because the cause is important to him. He came up with this idea, and now it’s being hailed across the world as a beautiful commercial. The video has become so popular with the general public that people are forwarding it to friends/family on their own so quickly that it has spread all over the world in a very short time. Check out this remarkable ad. From the New York State Teen Safe Driving Coalition, a video on parental teaching of driving to teens, courtesy of CBS and the National Safety Council. Members of the NY Chapter 2 Injury Prevention Committee hosted a Fire Safety Event at Brooklyn Hospital as part of regional efforts during National Fire Safety Week. 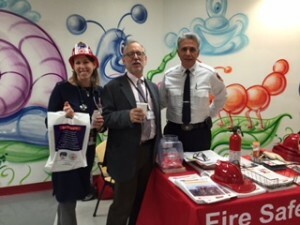 Pictured are Injury Prevention Committee Member Dr. Sara Kopple (L) and Dr. Ken Bromberg (R), Department Chair of Pediatrics at Brooklyn Hospital and Chapter Member with firefighter Lt. Dan Comer.